In an effort to help streamline the personnel transaction submission process, the Personnel Action Form (PAF) has been implemented to take the place of previous traditional methods of transaction submission. This e-form will allow users to submit all personnel transactions in an electronic format by having the user enter specific information. Attach Documents to a PAF - This document provides step-by-step instructions for PAF users on how to attach supplemental documentation to a PAF. Attaching electronic copies of supplemental documents allows for the PAF submission process to remain completely electronic. 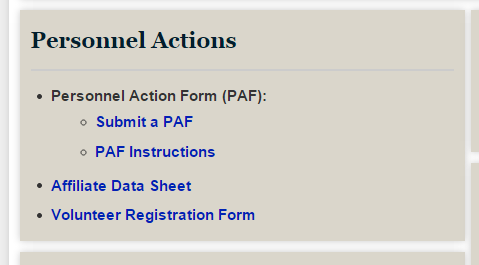 Request an RFA via a PAF - This document provides step-by-step instructions for PAF users on how to submit a RFA request via a PAF. Track PAF Progress - This document explains how University staff can use ImageNow/WebNow to track the progress of their PAF after it has been submitted. PAF and Contract Pay - This gives examples of how to submit a PAF for any faculty member eligible for Contract Pay. Found within this document are three examples of how a department can submit contract pay changes for eligible faculty members. Payroll Retroactive Funding Adjustment (RFAs) - This presentation explains what is an RFA, how do you know when a RFA is needed, and how to prevent RFAs. HR/Pay Calendar with PAF Submission and Time & Labor Deadlines. If you need help filling out a PAF or have any additional questions, please contact HRM at hrdept@ku.edu or call 785-864-4946.